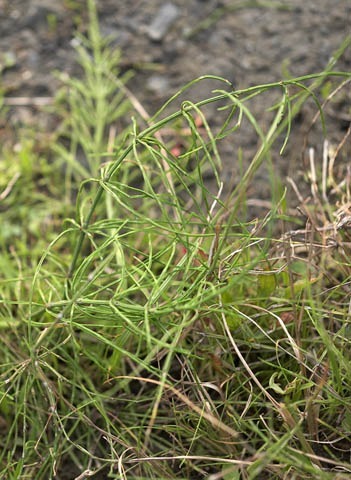 An infestation of a giant horsetail, Equisetum hyemale, has been found near Levin. It was spotted by eagle-eyed Department of Conservation staff. They gave us a specimen for Te Papa’s herbarium collection of dried plants. 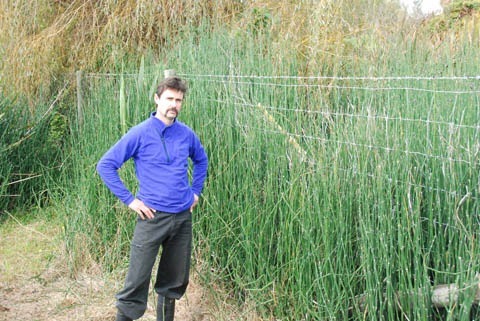 An unimpressed Jon Terry (DOC) with the Levin infestation of Equisetum hyemale. Photo by Clayson Howell, DOC. Copyright Clayson Howell, Wellington. Stems of Equisetum hyemale, with the terminal ‘cones’ that produce spores. Photo by Clayson Howell, DOC. Copyright Clayson Howell, Wellington. No horsetail species occur naturally in New Zealand, but several have been purposefully or accidentally introduced. Because they are invasive weeds, smothering and displacing other plants, all Equisetum species are ‘Unwanted organisms’ in New Zealand. They are also listed in the National Pest Plant Accord which seeks to “prevent the sale, distribution, or propagation” of specified pest plants in New Zealand. Regional Councils should be notified if horsetails are found in the wild, especially if they are suspected of being new populations. Environment Southland [document no longer available] and Weedbusters have useful information available on the web. Equisetum hyemale is native to temperate areas of the northern hemisphere. In New Zealand, we knew it had gone wild in Christchurch but it has apparently also become weedy in Whangarei, Auckland, New Plymouth, Levin, Motueka, Greymouth, Fox River, and multiple sites in Southland (Clayson Howell pers. com.). Most of these occurrences are fortunately relatively local. Two other horsetail species are adventive in New Zealand. Equisetum fluviatile has been found once in the wild near Hamilton. The other, Equisetum arvense (field horsetail) is, unfortunately, much more widespread. In the Rangitikei and Manawatu areas, for instance, it has well and truly escaped and gone wild. It is usually found around streams and other damp places. Equisetum arvense is much smaller (up to 80 cm tall, but often much shorter) and is branched, whereas Equisetum hyemale is unbranched. Photo by Jean-Claude Stahl, Natural Environment Imager. Copyright Museum of New Zealand Te Papa Tongarewa. 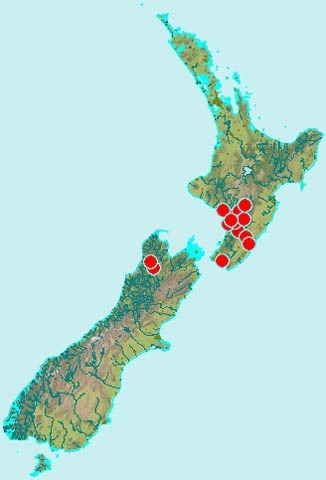 Distribution of Equisetum arvense in New Zealand as indicated by verifiable specimens in Te Papa’s herbarium. Te Papa’s collection is an under-representation of this species’ full extent, having been recorded by others from Auckland, Napier, New Plymouth, Christchurch, and Dunedin. To help with understanding the distribution of these weeds in New Zealand, we would appreciate specimens of horsetails from localities not already represented in our collection. Any wild Equisetum hyemale or Equisetum fluviatile is of interest, although Equisetum arvense is most likely to be encountered (see map for our present holdings). 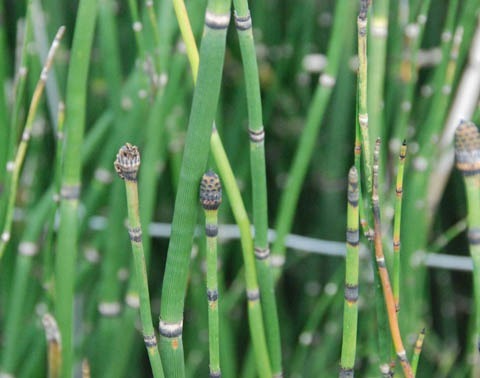 However, if collecting (or attempting to destroy) horsetails, please take care not to inadvertently spread them, as they can propagate from even fragments of their underground stems. Horsetails are an ancient and now evolutionary isolated group; they are more closely related to ferns than to any other living plant groups. They once were significant components of the world’s forests, but now only about 15 species survive. They occur naturally in all parts of the world except Australasia (and Antarctica!). Are you allowed to grow horsetail in a pot…for medicinal purposes? If you care about NZ nature and live near somewhere with natural values (waterways are particularly sensitive to being invaded by this plant), you’ll need to be very careful to keep your potted horsetail contained (e.g., isolated from a garden, so its rhizomes can’t spread there; chop off its spore-making cones before they mature). Because given a chance, it will escape and spread.